Simone Madigan from States of Nature shares some Q&A’s with Finders Keepers..
What does the States of Nature range include? The range includes clothing, accessories and homewares. 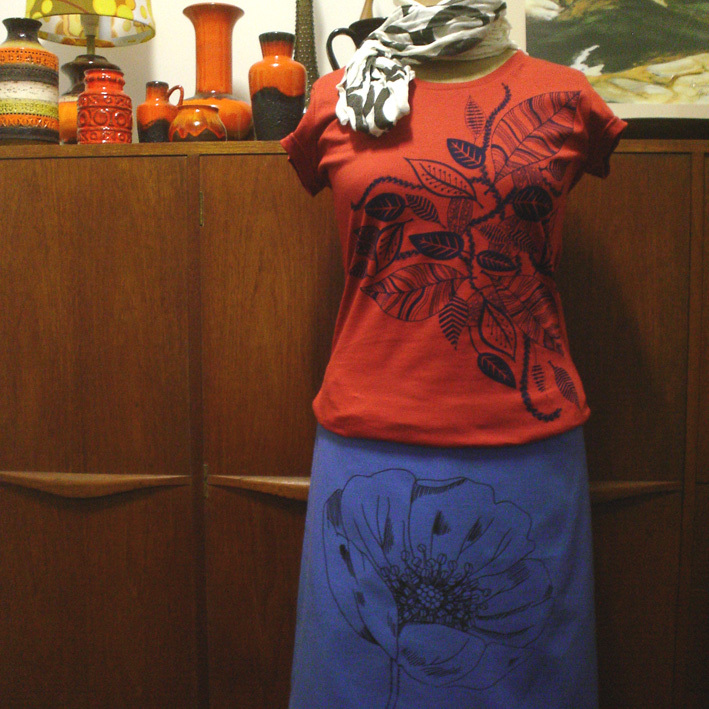 This season I’m doing fitted organic t-shirts, as well as a-line skirts printed with my designs. 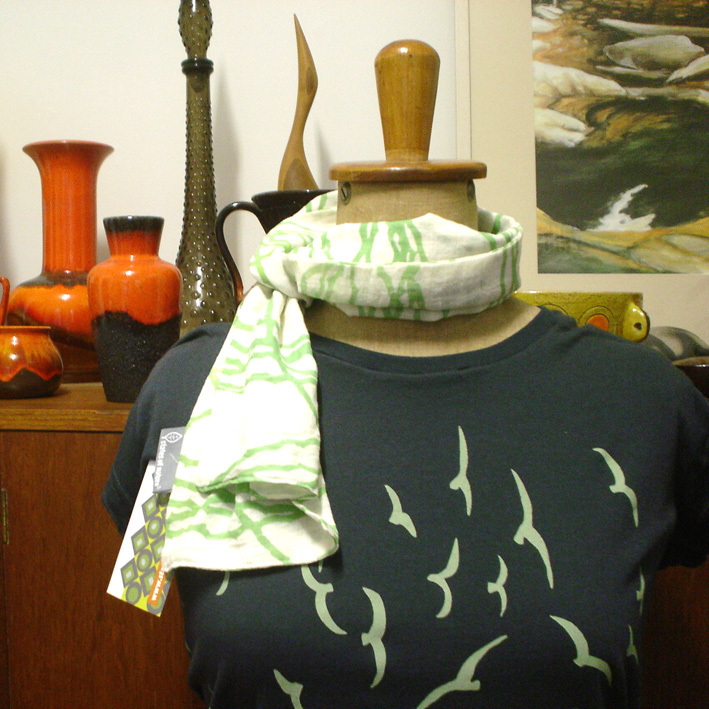 My accessories range includes superlight, long voile scarves and timber brooches in a variety of styles. 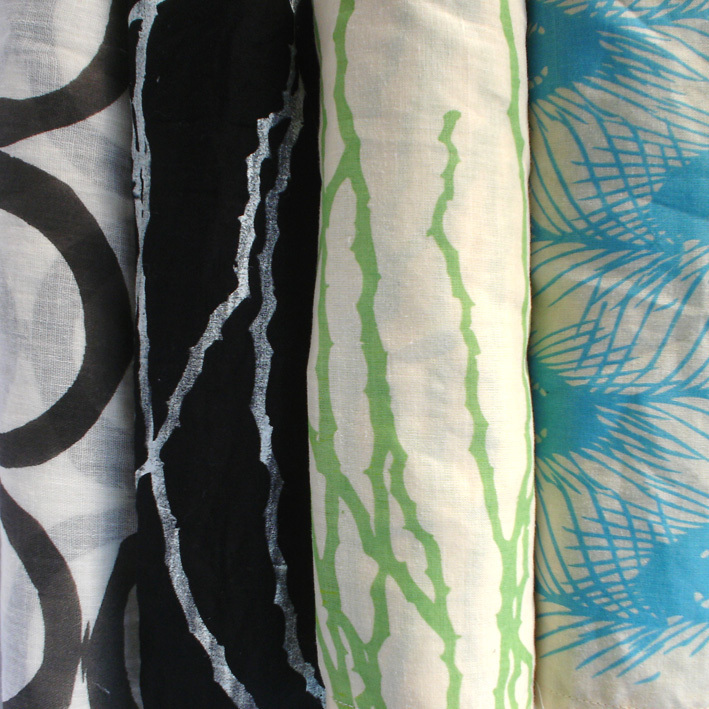 Homewares this season are colourful high-quality tea-towels in a linen/cotton blend fabric. What inspired you to start States of Nature? I did a graphic design degree in the 90’s and my first job was as an illustrator for a big fashion company in Melbourne. I traveled around and worked in design and illustration for fashion and interiors, and I have also taught at design colleges. But throughout my career and travels, I always found ways to make prints from my drawings and photographs. Now I am able to bring it all together in States of Nature. What makes States of Nature unique? The thing I’m most proud of is that my work is handmade in Australia and uses the most eco-friendly processes and materials available. When I started out I did everything, from design through to delivery, but now I have a great team of people to help me. I was very conscious that if I was going to go out on my own, then my product had to be well thought out, using sound environmental practices and high quality materials, and finally when it comes to the end of life-cycle, easy to recycle. I like things that are eco-friendly without necessarily looking like they are. There are plenty of technologies we can use now that are less harmful to the planet, they might seem a bit unusual or expensive, but they will one day be the regular standard. I was inspired to do the ‘doily’ brooches as I am a collector of vintage fabrics and ceramics. I have a friend who is also a collector, and together we haunt auction houses and devour Devonshire teas. At one auction, we spotted a big box full of masses of old linen, curtains and lace doilies. Of course we bought it, and then we had a wonderful afternoon dividing it all up between us in the living room. But most of my work is inspired by nature, and I have a policy with States of Nature to use materials I have personally tested for quality and sustainability. 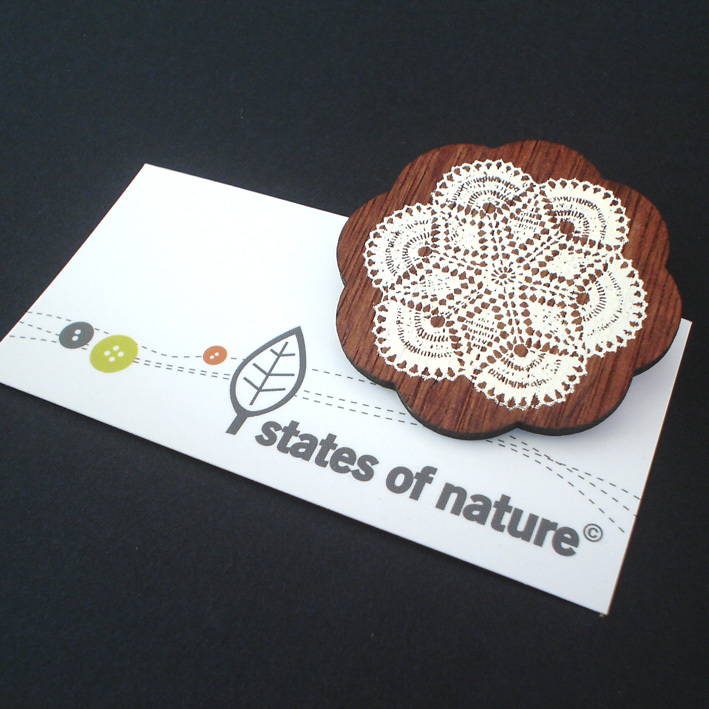 That’s why the brooches are made from Australian plantation timber and printed with eco-friendly inks. What new things are in stall for States of Nature for 2009? I will continue to design and print all my own products, because developing my ideas and printing them is my favourite part of the creative process. It can be really hard work, and physically demanding, but it is so much fun. I also hope to do a collaboration with a ceramicist friend of mine this year, where we will be printing onto clay and exhibiting together at the end of the year. What has been your biggest obstacles in starting your business? The biggest obstacle for me has been having the time to really dedicate to it. But that’s all changed since I’m now working full-time on States of Nature – Hooray! Beautiful collection of fabrics and LOVE the doily brooches.